Our ice cream machine is very easy to use! The first step is the hardest: choosing your flavours. There are so many options, so do not limit yourself to just fruit. For best results, your berries should be frozen. Any hard ingredients should be chopped into cubes no larger than 0.5cm. Nuts and chocolate should be finely grated or chopped to ensure they don’t block the nozzle which would then need to be cleared. 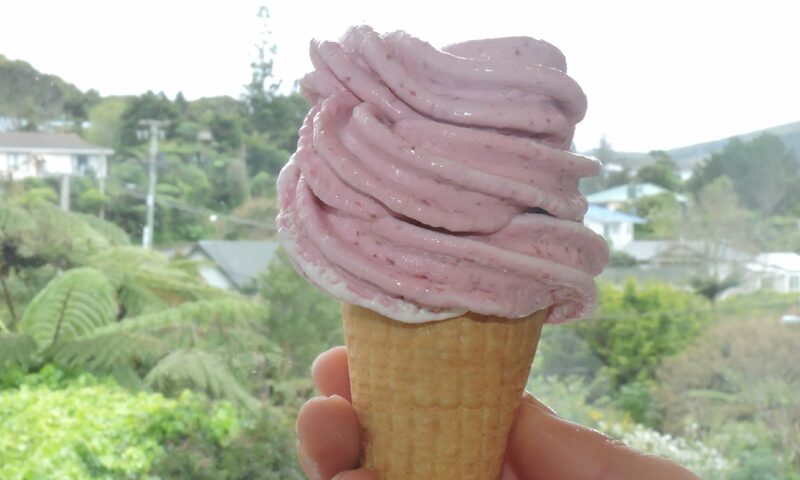 The ice cream should be as cold as you can get it – straight from the freezer is best! If this is going to be a problem, check out our portable freezer. Place the machine on a sturdy table – it’s a commercial machine and has some weight to it. Prepare your ingredients – go to the Ingredients page for ideas. You will need a cone or bowl serving, 2 scoops (120 grams = 200ml) of ice cream or frozen yoghurt, and around 40 grams of flavourings. 40 grams is good for berries, you might want to use less for stronger flavourings though (such as maple syrup). Plug in to a normal household power point. There is a black power on/off switch on the right hand side – turn this on. Place your ingredients into the machine’s “cup”. Pull the handle on the right hand side down. This will raise the cup up towards the churner mechanism. Hold your cone/bowl under the cup. The motor will only start when the cup is about halfway towards the churning bit. The slower you pull the handle, the softer the ice cream becomes. When you release the handle, the motor will stop. Serve or enjoy your delicious creation. We recommend that you make a few ‘test’ ice creams in advance of your event, to get used to how to operate the machine. Since it can take a few ice creams to get the hang of it, we recommend that you dedicate one or two people to operating the machine during your event (as opposed to having your guests operate it). When we deliver the machine, we’ll include laminated instruction sheets, with photos, showing how to use and clean the machine. You don’t need to be too pedantic when cleaning as we thoroughly clean the machine between all bookings regardless. You can contact us by phone or email during your event if you encounter any trouble.